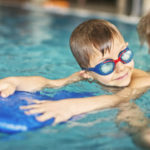 You are here: Home / children's therapy / Make a big splash with Aquatic Therapy! Water-based therapy can be just the challenge, or motivation, your child needs! Join us at the Benjamin Harrison YMCA. Immediate appointments available now! Filed Under: children's therapy, why ctc?